Centennial believes everyone is worthy of respect and dignity. Students learn to accept responsibility for their own actions, think critically, and become self-reliant, self-supporting, contributing individuals. This includes facilitating the transition from senior high school into the workplace and/or continuing education, as well as developing a positive regard for life. 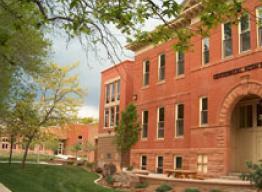 Housed in a historical 1907 facility, the remodeled Centennial High School has a building trades program, an arts and sciences wing, and a flex room in addition to classrooms and offices. Courses and content parallel the standards-based curriculum offered at the district’s comprehensive high schools and meet required district and state standards. Roads Scholar Program: This academic, experiential class engages students in school work and travels to various places where students interact with people, perform service learning projects, and return to make presentations to the Fort Collins community. 75-minute classes allow time for hands-on learning, group work, and alternative instructional methods. Every student signs a pledge card, committing to maintain a positive learning attitude, to attend class regularly, to learn in each class, and to remain on task. Pledge card commitments are used as a basis for continued enrollment status. Trained peer mediators are highly successful in resolving student-to-student conflicts. Parents are encouraged to attend four 2-hour training sessions to learn the same skills taught to their students in Discovery class. A health center is available five mornings per week with nurse practitioners and mental health therapists are available to support students. Centennial’s program is a nationally recognized, exemplary alternative high school program. Each year state and national officials visit the school.